My entry for the second round of Immunity challenge of AP Clash. As always, comments, faves and constructive criticism is welcome. ...Now, if I could only come up with an idea for the 'Waldo'.... .___. Beautifully done! It's soooo pretty. ^-^ I'm sorry I don't have much constructive criticism for you. lol. I will however use it as my desktop. Your wall looks so great! Awesome work, the blending is so great in this. to the sky right? Looks fantastic, has alot more depth and distance. it's just a great touch and brings the wall together as a whole I think. The bg is perfect, great blending and the textures really make it look movie poster like. Really cool wall. I like the over all color scheme a lot, the textures you used on the sky and the ground, and the planet looks fab. This is a great example of old-school walling! Great work, I love it. Amazing blend, I actually love how your character blends in with the darkness of the background. Excellent use of stock, plus hooray for brushes! this wallpaper is just awesome ? I love the way you have combined all those stocks in one wall..
wow! sooooo cooool! I simply LOVE IT! Woaaaah so beautiful! I love the use of the moon (?) in the back and the shooting star...the whole thing gives off such a sad...I want to say bittersweet, but bitter doesn't really fit....but a sad, sweet, nostalgic feeling. <3 amazing! 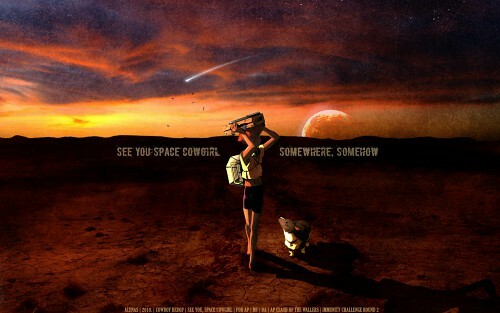 awwww~...i love cowboy bebop!...feels so nostalgic...oh well..great wall..
like the landscape it is very red a pretty.